Finnish violinist Pekka Kuusisto is one of the most versatile and distinctive musicians working today. Always demonstrating his extraordinary individuality and imagination, he is unusually free and fluid in his approach and has been acclaimed for the spontaneity and freshness in his playing. Setting Pekka Kuusisto apart from most other violinists of his generation is his desire and ability to improvise, and his love of playing many different styles of music, channeling the same intensity into each genre. 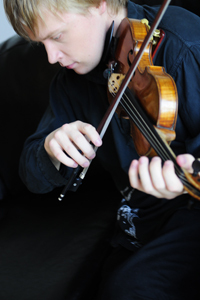 Pekka Kuusisto began to study the violin with Géza Szilvay at the age of three. In 1985, he went on to study with Tuomas Haapanen at the Sibelius Academy. He also studied with Miriam Fried and Paul Biss at Indiana University in Bloomington from 1992 to 1996. Pekka Kuusisto became the first Finn to win the Sibelius Violin Competition in 1995. He has since performed with many of the world's leading orchestras and conductors. In 2006, Pekka Kuusisto became Artist in Association with the Tapiola Sinfonietta. In 2009, he was selected as one of eight individuals in the Konzerthaus Dortmund's celebrated "Junge Wilde" series. Apart from his appearances as a soloist, Pekka Kuusisto also performs chamber music, jazz, folk music, and electronic music. As Artistic Director of Finland's "Our Festival" at Lake Tuusula each summer, he creates his own programme of events. Pekka Kuusisto has made numerous acclaimed recordings for Ondine. His catalogue includes many works by Jean Sibelius, including the Violin Concerto with the Helsinki Philharmonic Orchestra and Leif Segerstam (ODE 878-2), other pieces for violin and orchestra with the Tapiola Sinfonietta (ODE 1174-5), and works for violin and piano with pianist Heini Kärkkäinen (ODE 1046-2). He has also recorded Vivaldi's The Four Seasons (ODE 939-2), Mozart's Violin Concertos Nos. 3, 4, and 5 (ODE 1025-2), and works by Olli Mustonen (ODE 974-2). Together with his brother, violinist Jaakko Kuusisto, he performs on a disc featuring the complete Violin Concertos by J.S. Bach (ODE 980-2). In 2010, he released a disc of duo works by Paganini together with guitarist Ismo Eskelinen (ODE 1142-2) and his most recent release showcases the complete works for violin and piano by Finnish composer Rautavaara (ODE 1177-2). Pekka Kuusisto plays a Giovanni Baptista Guadagnini violin of 1752 kindly loaned by the Finnish Cultural Foundation.